Our people are our greatest asset. We have some of the brightest minds in the industry and believe in enabling our employees to be the best they can be by providing the resources and opportunities needed to be successful. 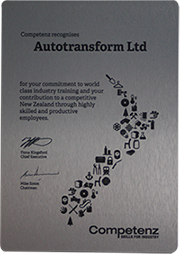 Auto Transform is recognised by Competenz for our commitment to world class industry training and contribution to New Zealand. If you believe you have the skills, attitude and experience to join our high performing team, please get in touch – we are always on the lookout for talented individuals.